Fur garments figured prominently in designer Travis Taddeo’s 2013 fall-winter collection at World Mastercard Fashion Week in Toronto last week. For those who attended last week’s Toronto World Mastercard Fashion Week, it was obvious fur is back in a big way. Mink coats and shawls dotted the backs of fashionistas teetering on their heels as they lined up for the runway shows, and fur was a common sight on the runway as well, where its was featured in countless collections. No one appeared to bat an eyelash at a trend that in the past has set off a storm of controversy. Fur, it seems, is fab again. While Danielle Katz, a campaign manager at PETA says her organization handed out antifur literature at New York Fashion Week — where fur was also trending — and encouraged supporters to do the same in Toronto, there were no protesters on hand at this city’s event. Fashion and fur proponents say attitudes about fur have shifted in the last decade. They point to several factors, including improved trapping standards, more affordable designs and a younger more informed generation learning about the evolving fur industry. “In the past few years, especially last year, sales have been way up and we’ve seen furs become much more popular with a younger crowd,” says John Kahnert, the vice-president of Kahnert Furs located on Avenue Rd. Kahnert’s store is a fourth-generation family business. He says he hasn’t seen this sort of interest in fur since the early 1980s — the last time business was so good. He says there’s a reason for that. “You take a look at the late ’80s and ’90s, the animal groups destroyed a lot of the fur industry and the interest in buying fur was low,” Kahnert says. Alan Herscovici, the vice-president of the Fur Council of Canada, agrees. “Back then large animal welfare groups had millions of dollars behind them in PR and support to get their message out. The fur industry, which has mostly consisted of trappers, artisans and farmers, is a smaller group and their side of the argument didn’t get heard,” Herscovici says. He believes the rise of the Internet and a younger generation hungry and able to do their own research into the fur industry, paved the way for fur to become a trend again. Herscovici says in 2012 the value of fur exports in the country was well over $450 million and he expects that number to rise next year. Travis Taddeo, the Quebec-based designer who featured several fur pieces in his fall 2013 collection shown last Friday, says he noticed a shift from when he began incorporating fur into his collections in 2002. “When I presented my first show sponsored with NAFA (North American Fur Association) I got mixed reviews, and I think there was a bit of fear in the public, they were hesitant to show what I was doing if it involved fur,” he recalls. For his 2013 fall collection — also sponsored by NAFA — Taddeo says he didn’t think twice about incorporating raccoon, recycled fox, coyote and beaver into his clothing. “If young people are going to wear fur, they don’t want to wear their grandmother’s coat,” Taddeo told Toronto Star reporter David Graham. Herscovici echoes Taddeo’s claim, pointing to another change in the last decade: designers have come up with different ways to use fur and, with advances in technology, there are mixing it with different textiles, creating a versatility and accessibility that hasn’t been seen before. “Young people now have an option. They don’t have to buy an extremely expensive piece, such as a fur coat. Designers have found ways to make it more affordable in terms of meshing it with other materials and using it for smaller accessories that won’t cost as much,” Herscovici says. Another significant change, he says, is the improved trapping standards. “The fur industry is heavily regulated at the provincial and national and international levels,” he says, adding to become a trapper in Canada you need a licence and must take a course on humane trapping. 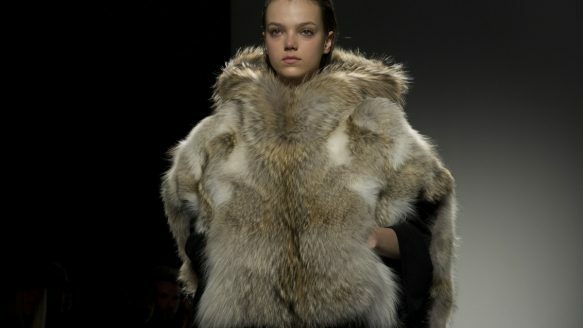 “All these things have made a difference in people’s perception of fur and it’s constantly improving,” Herscovici says.